Just adding technology to a lesson doesn’t make the lesson stronger or more valuable. Tech tools need to be intentionally integrated into the classroom. Purposeful implementation and continual evaluation of the technology you use in the classroom will help you create a culture in which the use of technology is maximized to create high-quality learning experiences. 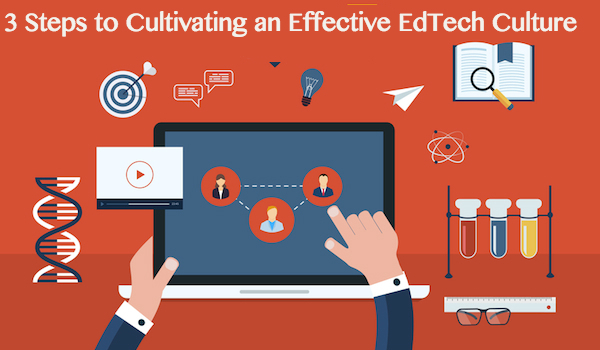 Here are three different ways to ensure that you’re cultivating an effective EdTech culture in your classroom—one that promotes both education and fun learning opportunities for your students. While technology can be fun for students, classroom tools shouldn’t be used for communicating with peers the same way Facebook, Snapchat or Instagram are—the focus should always be on education. Write these rules on a large poster board and hang them in the class. You can also add them to your classroom blog or any other online community where notes can be left. • What is your favorite/least favorite feature of the tool? • What is one thing you learned while using it? • Did you like (insert specific feature that you thought would be valuable)? Why or why not? Not only does this tell you how your students feel about the tool, it gives you a better sense of how they’re using it, while requiring them to think critically about something they consider a “game.” This creates an effective EdTech culture, where students are as critical of the tools they’re using as you are. EdTech tools make it easy for teachers to gather data about their students’ progress in nearly any subject. You can use this data to determine which tools are most educational and effective for you and your students. For example, Accelerated Reader asks students to answer questions in multiple-choice format. While this tool is educational in that it’s holding students accountable for their reading, a similar tool, Whooo’s Reading, prompts students to answer open-ended questions, which requires a higher level of thinking. In this case, both products are valuable, but that one feature may make the latter platform better for your students. Technology in the classroom is only as valuable as you make it. This means you should always be focused on purposeful use of tools, assessing progress, and getting feedback from students to determine what’s effective and what isn’t. Follow these three basic rules and both you and your students will reap the benefits. Jessica Sanders is the Director of Social Outreach for Learn2Earn. She grew up reading books like The Giver and Holes, and is passionate about making reading as exciting for young kids today as it has always been for her. Follow Learn2Earn on Twitter and Facebook, and send content inquiries to social@learn2earn.org.